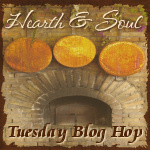 There were lots of wonderful recipes and posts shared with the hop last week. I’ve chosen four posts to feature, all of which share unique and delicious ideas. Right, on with the hop! Please link directly to your post, not to your home page. Thank you so much for hosting! Love your H and H party..looking fwd to clicking to the others’ posts once more get added! Thank you for hosting, April. I don’t know how I missed waffle pizza last week, but that is definitely something I need to make for my son! It would definitely be a fun dish to make, that is for sure! Thanks for the party April! My pleasure, Anne. Thank you for joining in! Just found your hop – how exciting. Thanks for hosting! Just happened upon this on my feed! Great features April! Thanks for this great blog hop! Thank so much for featuring my Lemon Basil Pesto! The other features look wonderful. Thanks again! I forgot to thank you for hosting. This week I shared a Honeydew & Lime Agua Fresca. It’s honey sweetened and made with coconut water. Thanks again. It’s a pleasure. I was really taken with the idea of a nut free pesto!